This year, Brita is celebrating Diwali with you by including two handcrafted diyas in every limited-edition Brita Diwali pitchers. There is no better décor in Diwali other than dazzling diyas. Every diya included is unique and comes in over 80 different design themes. Furthermore, in recognition towards the South Asian community, and to celebrate Diwali, Brita was the presenting sponsor of the Festival of Lights. They gave away more than 4,000 diyas to visitors, as well as complimentary water refreshments to keep guests hydrated. “Brita is proud to be the presenting sponsor of the Festival of Lights. We’re ecstatic and grateful to spend this festive season with Canada’s vibrant South Asian community. 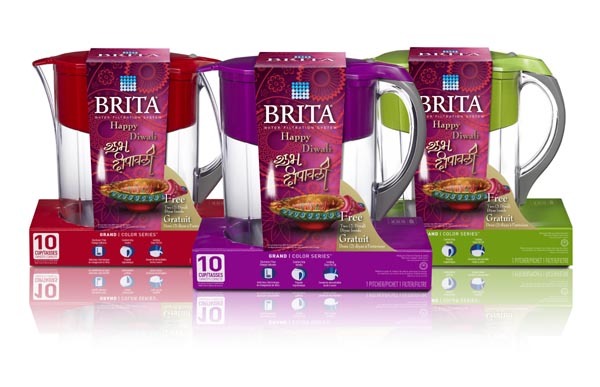 This Diwali, Brita is offering colourful, festive pitchers with limited-edition packaging along with two free handcrafted diyas. We hope to help South Asians celebrate traditions in what might be a new home in Canada, or to pass customs onto the next generation for families that have called Canada, home for years,” said Sarah Au, Brand Manager, Brita, Clorox Company of Canada. Diwali pitchers come in three festive colours – red, purple and green, matching all your Diwali decorations. “These colourful Grand Pitchers hold up to 10 cups of water — perfect for making tea/sherbets or serving filtered water to all your guests,” said Sarah. Besides using Brita for beverages, you can use it directly in cooking or washing ingredients. By filtering tap water, you’re improving the quality of the most basic ingredient in cooking. You will be surprised at the difference good quality ingredients can make. “Water is already engrained into your routine whether it is drinking it at the gym, cooking for your family or making your morning tea or coffee. Brita makes tap water taste better. “We want to celebrate Diwali with you and your family but also help in your everyday routine,” Sarah added. Brita filters ordinary tap water into cleaner and better-tasting water compared to tap water, which is vital in preparing your flavourful refreshments and feasts. Test results show that Brita pitcher water filtration systems reduce the common contaminants chlorine (taste and odour), copper, mercury and cadmium. It also helps the environment by reducing waste that ordinarily ends up in landfills. One Brita® filter can replace up to 300 standard 500ml plastic water bottles. Brita® has a range of products including filtering bottles, all of which are BPA free that ensures your access to cleaner, better-tasting water compared to tap water at home or on the go. When it comes to changing, their advanced pitcher filter is twice as fast compared to previous Brita filters, with no pre-soak required. It is guaranteed to work in all Brita pitchers, including the limited edition Brita® Diwali Grand Pitcher in a festive colour, a perfect duo for a Diwali gift.